Like other pages here this information is based on my experiences and what I've learned from others. From these experiences I know most of this information to be true. Depending on you and your needs it may be off just a bit. I'm happy to hear from any of you who know otherwise or have new information to add to this page. I struggled with what to include in this section and what to separate to make a section of it's own. 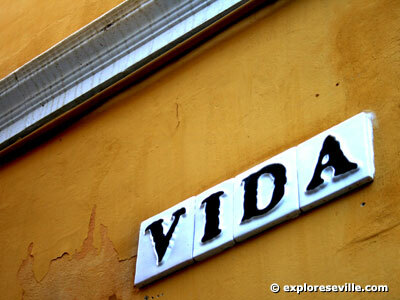 So other basic and helpful information about Sevilla can be found in sections like transportation, maps, money, health & safety and weather. In those cases I thought the topics needed more explanation than just a few paragraphs. 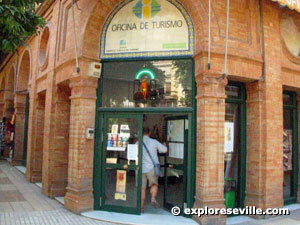 I highly recommend using the tourist offices in Seville for maps and general information about the city. They have plenty of information in all languages and like this page they are free! Other items you can pick up are Welcome and Ole, two tourist magazines which cover the sights and other activities for the month. There is also El Giraldillo, which covers a lot of cultural events such as art exhibitions, music, theatre and dance performances. You can sometimes get maps (at a small cost) of other cities. After that you'll find plenty of other flyers advertising monuments, tours, restaurants and more. There are two very central tourist offices dedicated to the city: one in Plaza San Francisco adjacent to the Ayuntamiento and Calle Sierpes. The other is on Avenida Constitucion as you pass the Archivo de Indias on your way to the Puerta de Jerez. In the Plaza San Francisco location it's worth noting they have several computers which you can use to quicly check your email or a web site. There is a short time limit for use but these come in handy as most cyber cafes have closed in Seville! Another central office is in the Plaza de Triunfo. 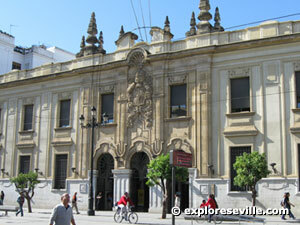 This office is dedicated to the province of Seville but they'll have plenty of information about the city as well. A few more tourist offices are around the center (see right panel). And then there are two more locations: San Pablo airport and Santa Justa train station. Both have small offices which are very convenient when you arrive and need a map or a little more information. Many have time limits on the credit: use your balance before it expires. Some cards expire in 30 days. Check for connection fees: some may have a lower per minute fee but charge a connection fee. Buy in Seville or Spain: some discount stores in other countries (for example Costco or Sams in the U.S.) offer prepaid calling cards. Often there are problems using them once you are in your destination country. Best to buy a card in Spain. You can bring your mobile phone with you but check first all of the charges from your provider. Roaming can be very expensive, especailly if you have to call a mobile phone in Spain. It will also be expensive to call back home. And then there are data charges should you wish to check your email, the web, etc. I won't even begin to get into what a rip off romaing data charges are. If you plan to use a mobile for calls within Spain you may also consider buying a pre-paid Spanish SIM card. This gives you a local number, much cheaper calling and you can add a more reasonably priced data package. SIM cards cost practically nothing: you may pay from 10-20 Euros but most cards come with a small amount of credit so you end up paying less. This works best if you already have an unlocked phone, but you can also pick one up locally for as cheap as 50 Euros, in some cases less. Finally if you have a smart phone and don't mind hopping around to WiFi hotspots in Seville, you can use the Skype mobile app to make cheap calls over the internet (see below). Unlimited calling plan: to any one country, Europe or the whole world. Keep in mind this generally does not include calls to mobile phones outside of the U.S. so you would have to buy additional credit. Credit: you can add credit and use the per minute calling rates. Online number: you can buy a local telephone number and forward it to your Spanish or foreigh mobile. You will have to buy credit and this will cost you when people call you. The advantage is having a local number in your home country o friends or family can call you at no additional charge. Mobile Phone: for most smart phones Skype has a mobile app which will allow you to use Skype directly on your mobile phone. If you are visiting this means finding a WiFi spot and then you can call for cheap. You can use Skype on the 3G or 4G networks but as data is quite expensive this often costs more than a normal phone call (assuming you are not a resident with a flat rate data plan). The main post office is located in the heart of the center on Avda. Constitución, just across from the Archivo de Indias. Once you enter you need to take a number from one of the machines depending on what service you need (pick-up, mail, etc.) Then keep an eye on the screen until they call your number. The screen will reference your number plus the the number of the window you need to go to (no worries, it's fairly easy). There are several stations located where you can fill out slips for various types of mailings (packages, registered and urgent letters, etc.) as well as a machine or two right at the entrance where you can purchase stamps and envelopes for mailings. Note you can always purchase stamps for letters and post cards at the local tobacco shop, or estanco. When shipping something urgent from Spain to the U.S. or another country I recommend using UPS, if only from my brief experiences in mailing documents. My last mailing cost about 35 Euros to get one set of documents to the U.S. in two days. I shipped this using the local Mailboxes, Etc. office on calle Jesus del Gran Poder. All of the tracking information was sent to my email address where I received updates on the shipment including final delivery. It arrived on time (48 hours) and I was fairly pleased with the service. I have heard Fedex is not recommended to use because they contract out their services to another company in Spain. This may be the case but I have never used Fedex so cannot speak from experience. The Spanish mail system, Correos, also offers a rapid delivery service. I just don't trust them yet to get it there as quickly as UPS. Finally it's worth mentioning that Correos has entered the 21st century with it's new locutorio in the main office on Avda. Constitución. You can now surf the internet or place a long distance call at very reasonable rates at the locutorio, located just through the doors to your left before you enter the main room. They are generally open all day until about 10 or 11pm. A call to the U.S. using their service comes out at 0,06€ per minute, especially competitive now that there is a 0,12€ surcharge on all calling card calls made from a public phone. Getting your laundry done while on the road can be a pain. If you are traveling around or simply need to get extra laundry done you can take them to a lavanderia in town. Rather than the coin operated machines you may see in the U.S. you will pay someone there and you can either wash it by yourself or have them do it for you. Typical prices for wash, dry and folding of one load are anywhere from 6-10€. New to the scene if Lavanet, which has the typical American laundromat: self service machines, free WiFi, drinks and even movie rentals! Strange but certainly a nice idea. Many places will also iron clothing for a fee. For dry cleaning head to a tintorería: El Corte Inglés in Plaza Duque offers a decent service and at a good price, too. Many of the recently opened youth hostals in the city offer a service or coin operated machines. 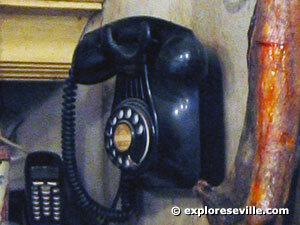 Of course a youth hostal in Seville may not be your style. Hotels will often do your laundry although it comes at a higher than normal price even if it's conveient. If you live in the city in a shared or private flat then chances are you have a washing machine. In almost all cases of your own apartment do not expect a dryer - not in the land of extreme heat in the summer. In the summer months your laundry may dry on the roof in just a couple of hours, which makes doing multiple loads in a day possible. Take a few pieces of advice from me when doing your laundry on your own: 1) do use fabric softener and still expect your clothes to be a bit stiff. I think this is mainly due to the water, but I won't claim to know exactly. 2) beware of the sun and fading clothes with colors, especially in the summer but also during other seasons. And I am not talking about over a number of washings, but literally from one day in the sun. When in doubt turn your clothes inside out, which helps. 3) if you live in a building you may have a specific place to hang your laundry or it may be a free-for-all, where it's first come first serve. In the latter case make sure you don't take up all of the space with several loads of wash and make sure you take your stuff down in a reasonable amount of time after it's dry so others can use the space as well. The three major Spanish newspapers here are El País, ABC and El Mundo. One note and something you have to hate about El País - you must be a paid subscriber to read the paper online. This makes no sense whatsoever to me and while it's a good paper this policy is just plain stupid. 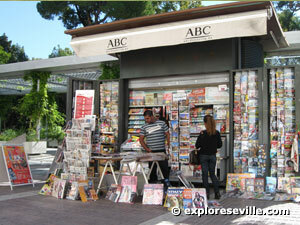 There are local editions of each of the above national papers, as well as local papers such as El Diario de Sevilla. A free paper called 20 Minutes can be found in the early morning where you may see people handing them out in the center. There are a number of other, smaller free newspapers you'll find in cafes and bars. If you're looking for news from home or other countries foreign newspapers and magazines can be found here at some kioscos or newsstands in the center of the city. The International Herald Tribune, now run exclusively by the New York Times, is offered daily except Sunday. The Tribune also include's a small 8 page version of El País in English. USA Today also offers an international version of the paper. Finally, a smaller version of Newsweek is available at some newsstands as well. One newsstand near the Cathedral (next door to Flaherty's Irish Pub) tends to offer all three on a regular basis. Of course in the age of the Internet you can always head to a cyber cafe and read up on everything you need. If you are searching for press from England, Germany and France you shouldn't have a problem finding the major newspapers. Two other publications are great resources for either classifieds or entertainment, dining and cultural events. Both are in Spanish, however. El Giraldillo is a monthly pub which covers dining, music, conferences, sports, movies, exhibitions, courses/study options as well as a few other random listings. A wide range of classified advertising, including apartments and housing, can be found in el Cambalache. 20 Minutos - Spanish language, daily (except weekends), free, ad-supported newspaper which is simialr to Metro. This can also be found around the city in the same locations as Metro. Qué - Spanish language, the newest arrival to the daily, free, ad supported newspapers. Follows the same distribution method as Metro and 20 Minutos. Casco Antiguo - Spanish language, free newspaper which can be found in bars and tourist offices covering news in the city center, such as renovations, new projects, art and exhibits, conferences and more. El Giraldillo - Spanish Language monthly magazine which covers all of the arts - music, theatre, exhibits, movies, festivals and more. Also has a large listing of classes and private schools, restaurants, trips and other local businesses. This is free at thr tourist office and some bars/restaurants. Sometimes necessary to buy at other lcations. Cambalache - Spanish language, 2-3 times weekly, classified ads, most known for their apartment and roomate wanted/needed listings. All other types of classifieds as well. Can be purchased at newsstands. Welcome Olé- free tourist magazine in English and Spanish available in hotels and the tourist office. Includes descriptions of the main sites, a few monthly and seasonal events plus a map. The Tourist - free tourist magazine in English and Spanish available in hotels and at times the tourist office. Similar to Welcome Olé, and my one big problem is their tourist information which tells you that it is customary to tip 10% at hotels, restaurants and taxis. Tell this to just about any sevillano and watch them laugh. Below are some sample prices for random things you may want to do, buy, eat, read or...well you get the idea. Use these prices as a general guide for costs while visiting Seville. Not included are prices for museums and tourist attractions. I think it's fairly cheap to go out for a drink, coffee or a few tapas when compared with other cities in Spain. As for tipping leave a few Euros at a very nice restaurant, and leave a little more if you have a bigger group that's been running the waiters around like crazy. You don't normally tip for informal meals or drinks aside from the extra change once you pay. As well, you don't tip taxi drivers either, but rounding off the change sometimes is nice. Contrary to what one of The Tourist magazines (hint, hint) says about tipping in Sevilla, it is not customary to leave 10% for every meal, cab ride, hotel or bar. If I had to recommend a flat percentage it would be closer to 5%, again excluding taxis, a drink at a bar or tapas where you can walk away without leaving a tip and not feel guilty. In general reward someone for doing something nice, providing good service or going out of their way, but these folks aren't expecting a large tip: they don't work for below minimum wage as is the case in the U.S. and some other countries. Not much more to add other than I am happy not doing the math - estimating 15% plus tax - every time I eat out. Most of these I hope you'll never need to know. Others can be quite helpful in the right situation. Listed below are the dates of national and regional holidays which fall on fixed dates. Expect banks and other government offices to be closed. Beware of other holidays which create puentes, or long weekends. 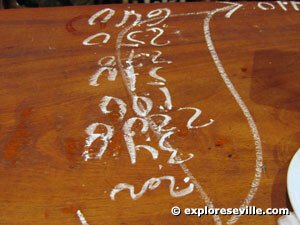 These can make finding a good hotel room a difficult process. Aside from Semana Santa and Feria you can almost always show up and find something, but your choices may be less than ideal in terms of location and/or comfort. And be prepared to walk around for a few hours if there is some special event going on. Also note that for some holidays that fall on a weekend, the date of business closings may be on a Friday or Monday, so be sure to study the calendar to anticipate closings which are around the dates below. Listed below are the dates of Semana Santa, Feria de Abril and Corpus through 2010. Note that the Feria de Abril dates are always tentative until they are confirmed around the beginning of December the year before. In most cases Feria de Abril falls 2 weeks after Semana Santa, although it is rare for the Feria to go into May, so sometimes (as was the case with 2006) they are closer together.